BRANTFORD – Wilfrid Laurier University’s Brantford campus is hosting a free lecture on policing and social media by visiting public scholar Christopher J. Schneider. “Policing and Social Media: Understanding New Changes to Publics, Police Image, and Police Legitimacy,” organized by Laurier’s Department of Criminology and Faculty of Human and Social Sciences, takes place Wednesday, Nov. 9 at 7 p.m. in Research and Academic Centre – West 002. Schneider will draw upon material from his newest book, Policing and Social Media: Social Control in an Era of New Media, and ongoing research to illustrate some of the institutional changes in policing related to the expansion of social media. Recent challenges to police legitimacy on social media have encouraged police agencies to further incorporate media technologies into policing practices, including the implementation of body-worn cameras. 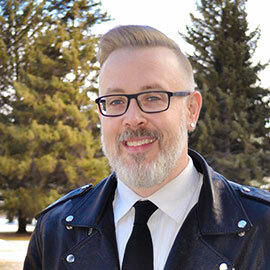 Schneider, an associate professor of sociology at Brandon University, is well known for his work on the role of media and information technology and related developments in social control. His research and commentary have been featured in hundreds of news reports across North America, including the New York Times. In 2018, he will hold the Endowed Chair of Criminology and Criminal Justice at St. Thomas University. Schneider will be a visiting public scholar in the Department of Criminology from Nov. 7 to 11. In addition to delivering a public lecture, he will offer workshops for faculty, graduate and upper-year undergraduate students.